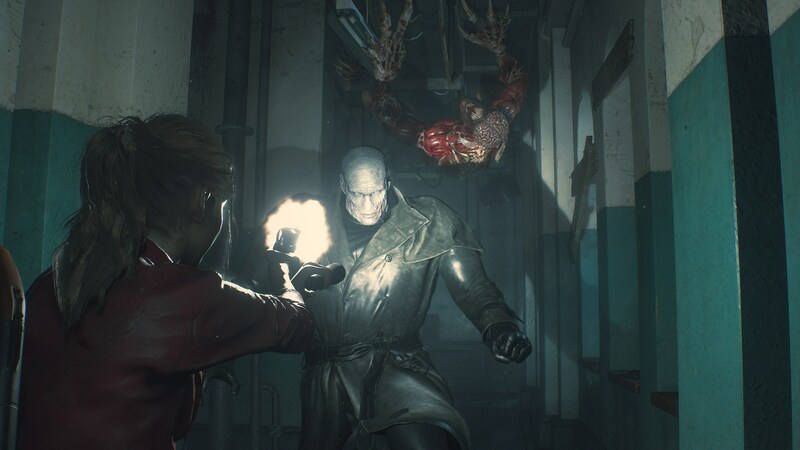 With Resident Evil 2, Capcom has stitched together a collection of faded memories and stuffed it full with modern game design and technology. Though this remake shares characters, settings, and basic plot beats with 1998's original, that's about the extent to which it resembles the PS1 classic. Nostalgia runs high throughout, but this Resident Evil 2 is a very new creation. Resident Evil 2 stars Leon Kennedy and Claire Redfield, now fan-favorites but new on the scene back in 1998. Leon is a rookie cop who arrives at an overrun Raccoon City for the worst first day of any job ever, and Claire, a college student, is the younger sister of Resident Evil protagonist Chris Redfield. 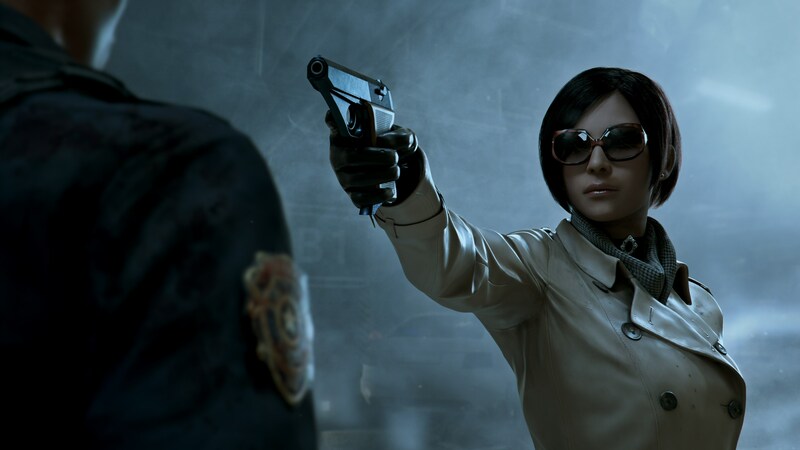 Along the way, they meet the Birkins, who harbor deep ties to the ominous Umbrella pharmaceutical company, and Ada Wong, a mysterious stranger who knows more than she lets on. 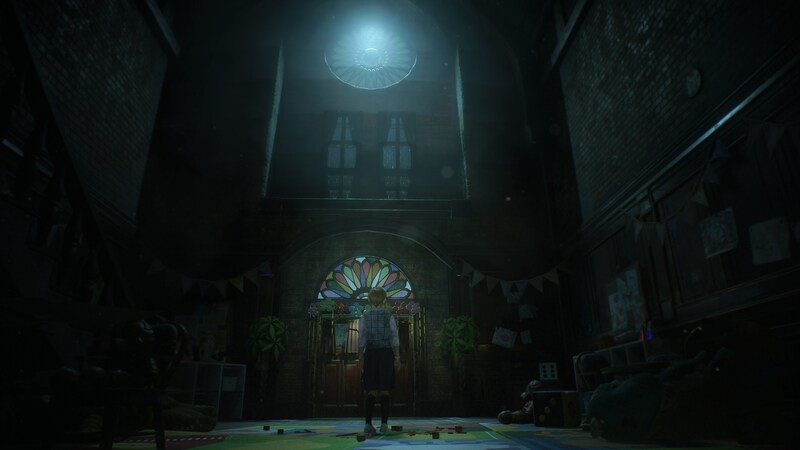 Players must choose between Leon or Claire and experience their version of a single, rainy night in Raccoon City. The Resident Evil 2 remake starts out in the rain and the downpour never stops. You can't escape it, not even after you take "shelter" inside the Raccoon City Police department. The hallways are flooded with murky grime, and each footstep feels sopping wet. It adds to the overall atmosphere and grounds Resident Evil 2 in a new layer of realism. Raccoon City was always meant to be a town gone to ruin, and now you truly believe it. Like the rain, Resident Evil 2 never lets up. It's both exhausting and thrilling to know that every decision you make determines whether you survive your next encounter. The limited ammo and storage system are-dare I say it?-perfected in Resident Evil 2. Do you take the green herb mix now before you go upstairs to complete a puzzle? Or do you hold onto it and try to sneak past the hallway of... hold on let me listen, two, no, three zombies on the second floor? How many bullets do I have? This would have been so much easier if I still had a combat knife, but I used my last one to escape the three zombies in the west office. I can't use the flashbang on them because I'll need it for Mr. X who is nearby somewhere. This is smart survival horror. Resident Evil 2 isn't a staged dollhouse where every monster is placed in a predetermined location. I've seen zombies who seemed to only stay in one hallway suddenly appear in places I never expected them to be. And Mr. X is the father of all stalkers and a constant terror. I recall once how I was at a location I thought Mr. X couldn't access, only to look up and see him enter through another door in the area. Then he noticed me looking at him and turned around to come after me. I never felt safe in Resident Evil 2 and it was terrifying. Resident Evil 2 brings back the over-the-shoulder third-person shooting style popularized by Resident Evil 4. It's how the enemies react to the hits that I want to focus on, though. Resident Evil rule number one is 'aim for the head.' Rule number two is 'double-tap a downed enemy.' But those rules don't apply in Resident Evil 2. Headshots need to be perfect to blow up a zombie's skull. If its head is still attached after five or more shots, then you've wasted five bullets. This also runs up against rule two, as you probably won't have enough bullets to double tap anything if you waste it all trying and failing to get a perfect headshot. A new strategy I found is to clip zombies in the legs. This means you'll leave a lot of enemies alive, but dodging a crawling zombie is easier than avoiding a walking one. The puzzles are pure Resident Evil in design. Ancient artifacts must be collected in order to open hidden passageways, and overengineered puzzles crop up from time to time that must be solved in order to make progress. Puzzles function similarly to how they did in Resident Evil 7, where engaging with a puzzle zooms into it rather than shifting to a different menu. This means some of the puzzles need to be completed in real-time, while others freeze time around it. I'd prefer it if every puzzle happened in real-time, but I have a feeling that would make the game much harder than it already is. I love a good challenge, and I appreciate how the monsters, claustrophobic level design, and limited resources come together to create a cohesive difficulty. But one stretch late in the game is so stacked against you, so sparing with useful items, and so heavy-handed with enemies, it feels impossible to overcome. By the time you reach safety, you're barely clinging onto life. The rewards for surviving the gauntlet hardly cover your losses and then you're expected to take on another big fight almost immediately afterward. This happened to me in the exact same spot on both playthroughs. And while I learned a lot of useful tips from my first playthrough, the area was no easier the second time around. It's just this one section of the game that feels poorly balanced and I can see a lot of players getting stuck there. Luckily there is an exit strategy, sort of. Resident Evil 2 has three difficulty settings: normal, survival, and assisted. Assisted mode, suggested to you if you die three times in the same area, regenerates your health up until the caution state (which is a level below your healthy state), weakens the enemies somewhat, and enables aim-assist. I felt forced to enable it late on in my first playthrough, but I'd argue that none of these aids are game-breaking or allow you to cheese your way through the campaign. Like the 1998 original, Resident Evil 2 tells its story split between two protagonists. The 1998 version had an A/B/A/B story structure where certain elements in the game changed depending on which character you played as first, and which character you played second (thereby creating four unique playthroughs). Resident Evil 2 does something similar but streamlines the story down to two playthroughs. The first character you play as will have to complete a longer opening section, and the second character plays through a shorter, harder version of the opening. From there the campaign branches diverge into Leon and Claire's unique story sections with slightly different levels and boss encounters. There is technically some different dialogue in the opening depending on which character you choose as your first protagonist, but it's not enough to say there are four different versions of the main campaign. Upon completing the main story campaign once with each character you'll unlock two bonus modes: 4th Survivor and Tofu Survivor. 4th Survivor stars Umbrella special operative Hunk as he races past an obstacle course of enemies in order to reach the extraction point. Tofu Survivor is the same mode, but you play as sentient tofu. 4th Survivor is legitimately the hardest part of the game, and it might have taken me longer to beat than my second run playthrough of the main campaign. Hunk is equipped from the get-go with a stash of weapons, ammo, and healing herbs, but it will take players several playthroughs to discover the optimal path to survival. Your time is recorded at the end and it encourages players to beat their high-score, but I think I'm happy with my 11 minutes 20 seconds finish. Resident Evil 2 keeps everything that made the original special but reframes it through a modern lens. Raccoon City was always a great setting for a horror game, but looking back it was never more than a collection of alleyways and burning streets. Now though, it’s a fully-realized environment, with dynamic enemies, terrifying bosses, and a home for smart, careful survival horror mechanics. 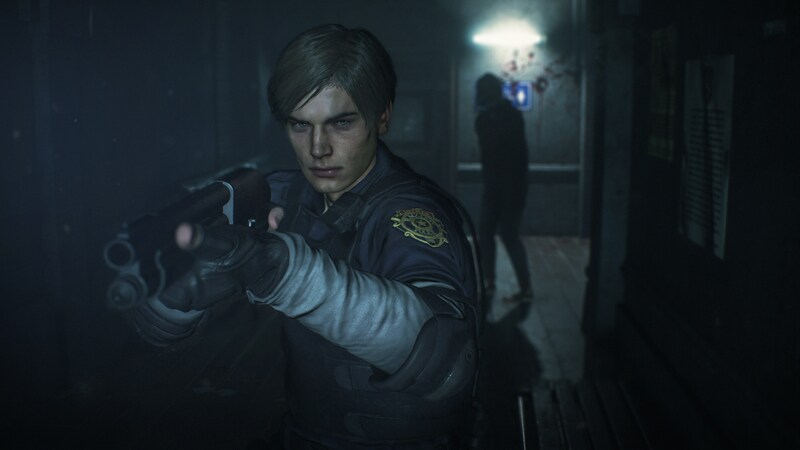 Capcom may have started to right the ship with Resident Evil 7, but with Resident Evil 2 it has proven that it fundamentally understands what makes this series so special. 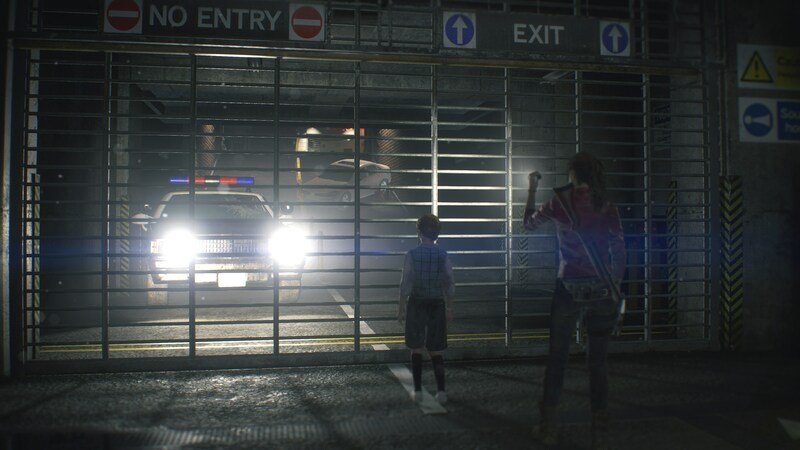 The sense of fear and terror when playing Resident Evil 2 never leaves you and it’s unlike anything else I’ve encountered in a Resident Evil game previously. I’m just going to go ahead and call it: Resident Evil 2 is the best Resident Evil game in the franchise and represents a series and developer at its peak. Don’t be distracted by the pretty graphics and gore, Resident Evil 2 is straight-up dangerous. Tagged with Capcom,	Horror,	PC,	PlayStation 4,	Reviews,	Shooters,	Survival Horror,	Xbox One.